The National Monument (Indonesian: Monumen Nasional, abbreviated Monas). Monas is tower symbolizing the fight for Indonesia. It is the national monument of the Republic of Indonesia also a Local Landmark of Jakarta, Indonesia, it’s built to commemorate the struggle for Indonesian independence (read more on Wikipedia). As an Indonesian people, I think I have to create it. This creation (MOC) is inspired by Yul Burman Karel’s Monas MOC, but I redesigned it. 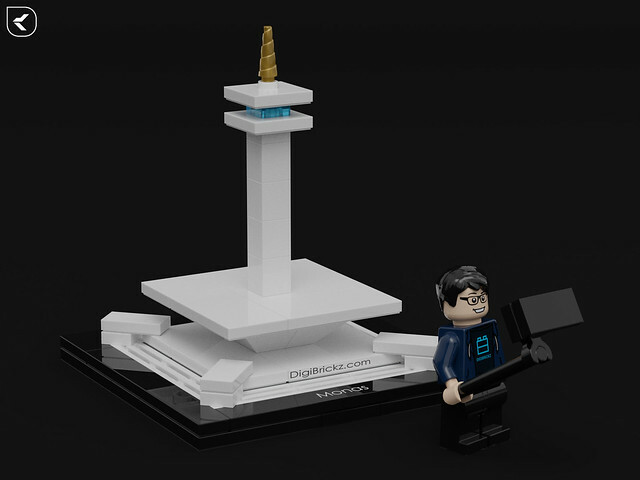 I actually created this for join this contest, but the rules state, “All entries are to include only real LEGO. No clone brands, 3rd party parts, or digital entries allowed”. Sadly, I don’t have almost all of the part in real life, though all the parts are exist in real life. Well, at least this could be an addition to my (digital) creations. Related Posts of "National Monument of Indonesia: Monas"
What could I have broken this brick?